THE CONTEST IS OVER – WE HAVE A WINNER! We here at Inti Creates, in partnership with our fast friends at SpeedRunsLive and GamesDoneQuick, are happy to celebrate the launch of Azure Striker Gunvolt on Steam (Windows PC) — and its super-new, super-cool Speedrun Mode — with a very special LIVE speedrunning contest where one lucky gamer could win just that! As we get closer to our first Gunvolt speedrun Qualifying Race this weekend, we here at Inti Creates have been tracking a rare bug in Speedrun Mode that can cause the game to crash; again it seems to be a rare edge case bug, and our programmers have issued a patch that hopefully addresses it, but since there are no “do overs” in the contest we wanted to err on the safe side and address the situation. Rather than delay the start of the contest a week, we’ve decided to treat the first race this weekend of Sept 12th as something of a practice test run — but one where the top 30% will still qualify for the championship race, as before — and add another Qualifying Race to the schedule for the day before the final race. This one will fall on Friday 9/25 at 6pm PST (Saturday 9/26 10am JST). This way, in the event that any of the runners do experience a problem, they would still have two chances to qualify for the Championship race. 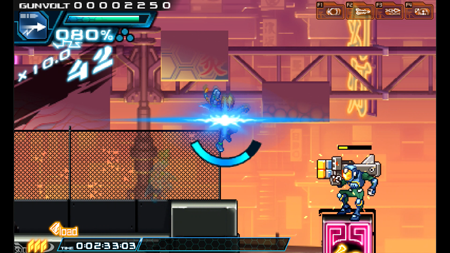 HOW TO ENTER AND WIN THE AZURE BLUR: GUNVOLT (PC) LIVE SPEEDRUN CONTEST! 1. Pick up a copy of Azure Striker Gunvolt for Windows PC on Steam. 2. Register for or sign into your livestream account at Twitch.tv. 3. Register for or sign in to your SpeedRunsLive account, and link it to your Twitch.tv stream (here’s how). 4. Use your registered and linked SpeedRunsLive and Twitch accounts to participate* in either (or both) of the two Azure Blur: Qualifying Races using Gunvolt PC’s all-new Speedrun Mode, and finish in the top 30% of all contestants in either race to qualify for the Azure Blur: Championship Race. 5. Use your qualified and linked SpeedRunsLive and Twitch accounts to participate in the Azure Blur: Championship Race* using Speedrun Mode, and finish in 1st place! *Note: To ensure all runs are performed live, all contestants will also need to perform a “Qualifying Act” as a part of each race for it to qualify for the contest. The exact Qualifying Act (for example, ‘jump straight up and shoot once at the start of each stage’) will only be announced five minutes before each race in the official SpeedRunsLive IRC race channel, as well as in channel #Gunvolt and on the official Inti Creates Twitter account @IntiCreatesEN, so make sure you don’t miss it! Please see the official rules below at AzureBlur.com for additional restrictions and details. Void where prohibited. Rules, race times, and official IRC channel subject to change by notice at the official contest site AzureBlur.com. Gunvolt’s all-new Speedrun Mode, exclusive to the PC version, pulls out all the stops – literally – by removing all cutscenes and implementing other options to focus Gunvolt into pure action gameplay. Speedrun Mode also adds a button display so that viewers can understand and enjoy the speed and intensity of the player controlling the game, and offers special tools for practicing tricky portions of the game. 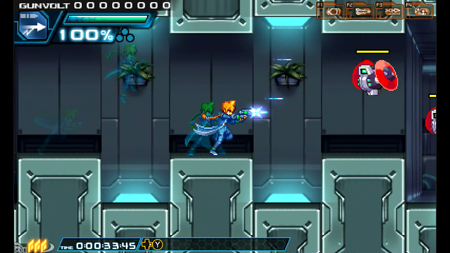 This new mode is designed to highlight Gunvolt’s replayability, challenging and helping players to truly master the depths of the gameplay and level design. SpeedRunsLive will be hosting all races in the contest, using their proven race registration and verification systems, as well as providing logistical and technical support, and helping spread information on the contest to their thriving community of speedrunners and livestreamers. An additional 25% of the total cash value of the grand prize will go directly to charity, in accordance with the mission of the charity speedrun marathon organizers at Games Done Quick. Details of the charity will be announced later at AzureBlur.com. Contest Period: The “Azure Striker Gunvolt Azure Blur LIVE Speedrun Contest” (the ‘Contest’) begins 12:00 AM Eastern Time on September 10, 2015 and ends at 11:59 PM EST on October 10, 2015 (‘Contest Period’). Eligibility: Contest is open to all owners of Azure Striker Gunvolt for the Windows PC (the ‘Game’) 18 years or older, who have reached that age at the time of entry, and who possess a valid passport. Void where prohibited. Employees of Inti Creates Co., Ltd. (the ‘Sponsor’) and their immediate families are ineligible to enter or win. Subject to all applicable laws and regulations. 1. Join #speedrunslive on irc.speedrunslive.com, by using http://www.speedrunslive.com/channel/ or other means. Note: If Contestant is using http://www.speedrunslive.com/channel/ for IRC, they will automatically join this channel. This will register Contestant’s current IRC nickname to the given email account, with the given password. 3. Check the official Inti Creates Twitter account @IntiCreatesEN or look in the races list provided upon joining #speedrunslive for the designated race channel, named “#srl-xxxxx” where “xxxxx” will be a generated name, and type “/join (racechannelname)”. Note: If you do not see the race list by default in the channel #speedrunslive, type “.races” on IRC to display the list. 4. In the IRC race channel, type “.enter” to enter the race. 5. Start their livestream on Twitch, making sure their “Automatically archive my broadcasts” Twitch option is set to capture the game feed. 6. Link their Twitch stream to SpeedRunsLive by typing “.setstream twitch.tv/(Twitch username)” on IRC. 7. Type “.ready” in the race channel on IRC when they are ready for the race to begin, before the official Race starting time, then await the start of the race by leaving the Game in-game selection cursor on “Speedrun Mode”. Note: You MUST have performed this ‘.ready’ step before the scheduled starting time or you will be disqualified from the race. 8. At or near the official race starting time, after the “Racebot” in the IRC race channel provides a countdown followed by the word “GO!”, Contestants are free to hit the select button on Speedrun Mode and begin their game. Contestants starting their Game before the Racebot says “GO!” may be disqualified at Sponsor’s discretion. 9. Perform a valid “Qualifying Act,” as decided by Sponsor, during their run at a time and of a type to be announced by Sponsor five (5) minutes before the official race starting time in the IRC race channel and on the official Inti Creates Twitter account @IntiCreatesEN. This Qualifying Act will be unique to each Race, and is designed to discourage cheating. More details about the Qualifying Act is contained below. 10. Once contestant has played through the Game in Speedrun Mode and as soon as they have dealt this killing blow to the Game’s final boss, they should type “.done” in the IRC race channel to signal that they have completed a Run. Game must then be played in Speedrun Mode, from beginning to end, as it is streamed live in accordance with the SpeedRunsLive system outlined above, to enter a ‘Run’ for consideration for judging. Contestants may keep playing after dying as many times as necessary to finish the Game and create a valid Run, but no save games, level skips or other means of skipping sections of the Game are allowed. Except with express permission or an invitation from the Sponsor or their designated agents, Contestants must first place in the top 30% of total Contestants in any single (1) Azure Blur Qualifying Race, adhering to all other rules and stipulations previously mentioned, to become eligible to enter into the Azure Blur Championship Race. Qualified Contestants must then finish in first place, as determined solely by Sponsor, of the Azure Blur Championship Race to win the Grand Prize. Furthermore, all Contestants MUST perform a valid “Qualifying Act,” as decided by Sponsor, in-game during a Run in any Race, or that Run will be disqualified, again as determined by Sponsor. Qualifying Acts are designed to discourage cheating and will only be announced five (5) minutes before any Race via, but not limited to, the following methods: on the official Inti Creates Twitter account @IntiCreatesEN, in the IRC channel #Gunvolt, and in the official SpeedRunsLive IRC race channel (which will be auto-generated before the race). A hypothetical example of a Qualifying Act, for illustrative purposes only, might be “Run left and touch the left-most wall at the start of each stage before you proceed”. Sponsor reserves the right to announce the Qualifying Act before or after the planned announcement period, and via any manner Sponsor judges appropriate should anything prevent Sponsor from announcing it as planned. Sponsor is not responsible for ensuring that all Contestants are aware of the Qualifying Act, and reserves the right to qualify or disqualify any Contestant or Run based on Sponsor’s judgment of adherence to the Qualifying Act. Sponsor reserves the right to add, remove, or reschedule any existing or additional Azure Blur Qualifying or Championship Races without prior notice. Contestants may only make a single (1) Run attempt in any single (1) Azure Blur Qualifying Race, but are free to enter as many Azure Blur Qualifying Races as Sponsor makes available. Any Contestants already qualified for the Azure Blur Championship Race taking part in subsequent Azure Blur Qualifying Races may be ignored when calculating the ratio of Qualifying Contestants, at the discretion of the Sponsor. Sponsor reserves the right to grant or refuse entry into a Race or consideration of a Run for any reason, including but not limited to technical problems, Contestant behavior in person, online, or on social media, or too large or small a group of Contestants or Qualifying Contestants, as judged by Sponsor. Any Run must be the work of the Contestant. Contestants suspected of using scripts, macros, pre-recorded video, emulators, slowdown, special controllers, other automated means or ANY means designed to undermine the competition, provide an unfair advantage, or not in the spirit of fair play, as determined by the Sponsor, may be disqualified from any Race or the Contest at any point without explanation. Judging: All eligible Runs will be based on their final completion time by timing the Contestant’s Twitch archive video, beginning with selection of Speedrun mode, and ending with the last hit to the final boss. If Contestant’s full Run is not available for viewing on his or her Twitch channel, or if there is anything in the video Sponsor deems irregular or questionable at their sole discretion, the Contestant may be disqualified from any Race or the Contest without explanation. In the case of any other unforeseen problems or difficulties, including but not limited to technical glitches, Sponsor reserves the right use whatever substitute criteria they deems necessary for determining ranking and winners. Decisions of the Sponsor will be final and binding. In the unlikely event of a tie in any Race, Sponsor reserves the right to choose a winner by any other criteria at their sole discretion, including but not limited to game score or in-game level ratings, or require the Contestants race again in an additional “Tie-Breaker” race. Prize Details: One Grand Prize winner will receive a trip to Tokyo, Japan or, at the discretion of the Sponsor in consultation with the winner, a trip to Boston, Massachusetts U.S.A., sometime in the period between November 9, 2015 and July 1, 2016, also at the sole discretion of Sponsor, in consultation with the winner. Trip consists of the following: round trip coach commercial air transportation for one (1) winner from a major international gateway airport nearest winner’s residence (as determined by Sponsor); one (1) room standard accommodations for a maximum of five (5) days / four (4) nights (as determined by travel segment) at a hotel to be determined by Sponsor. Total maximum Estimated Retail Value (‘ERV’) of Grand Prize Package is $3,600. Actual Grand Prize value may change based on the location of the departure city and travel itinerary, but no substitution or compensation will be provided for a difference in prize value. Travel must be made through Sponsor’s agent. Sponsor is not responsible for any expenses incurred as part of a flight delay or cancellation. If any Potential Winner cannot complete travel within the period specified by the Sponsor, the prize will be considered forfeit and the Sponsor will have no further obligation to such Potential Winner, but the Sponsor will make reasonable efforts to award the prize to an Alternate Winner. Winner is responsible for obtaining all necessary travel documents required by airline including, but not limited to, passports and visas, prior to travel. Winner is responsible for all costs and expenses associated with the acceptance and use of the prize, including federal and local taxes, ground transportation, meals, etc. Prizes are non-transferable, not redeemable for cash, and not substitutable except by Sponsor, which reserves the right to, at its discretion, change and / or substitute any components of the Grand Prize at any time. All prize details are at the sole discretion of the Sponsor. Winner Notification: A Potential Winner will be notified within ten (10) business days of the end of the Contest Period, via the email the Potential Winner used to register their SpeedRunsLive IRC Nickname. If email delivery fails, another attempt will be made to contact the Potential Winner via a private message to the Twitch account associated with the Potential Winner’s SpeedRunsLive account. The identity of the winner will also be made available on the official Inti Creates Twitter account @IntiCreatesEN within ten (10) business days of Sponsor receiving all required proof and properly executed documentation from the Potential Winner. If Sponsor is not able to get any response from the Potential Winner’s registered Race email or associated Twitch account via private message within a ten (10) business-day period starting from the time the initial email was sent by Sponsor, Sponsor reserves the right to award any prize to an alternate Potential Winner, as chosen by Sponsor. If any Potential Winner is not in compliance with these Official Rules, the prize may be forfeit and an alternate Potential Winner maybe be selected, at Sponsor’s discretion. Potential Winners will be required to execute and return a liability release, an affidavit of eligibility, and, where legal, a publicity release and any other documents required by Sponsor within five (5) days of issuance of such documents or the prize may be forfeited and an alternate Potential Winner selected, at Sponsor’s discretion. Winner will be required to provide different forms of information and ID as required by the Sponsor, including but not limited to full birth name, address, place of business or school. Sponsor may also require Winner to provide their Social Security number for tax purposes, in which case Sponsor agrees to keep such information secure and private and limit use to internal administrative matters. General Rules: Contestants acknowledge and agree that Sponsor may use their name, nickname, footage or still screenshots from their Run, avatar and / or likeness in promotion, public relations, and marketing of the Game and this Contest. Sponsor further reserves the right to edit, reproduce, publish, modify, or otherwise exploit any footage of any Contestant’s Run, for any reason that Sponsor sees fit, including but not limited to promotion, marketing, and public relations, in print, online, film, television, or any other media now or hereafter, without further compensation to Contestants. By entering the Contest, all Contestants warrant and represent that they are in full accordance and agreement with all Official Rules of the Contest. Any attempt to damage any website affiliated with or in use for the Contest or undermine the legitimate operation of the Contest is a violation of criminal and civil laws; in case of any such attempt, Sponsor reserves the right to seek damages or other remedies from the person(s) responsible for such attempt to the fullest extent permitted by law. In case the Contest is unable to run as planned for any reason, including but not limited to being compromised by bugs, a virus, non-authorized human intervention, or other causes that impair or corrupt the administration, security, or fairness of the Contest, Sponsor reserves the right in its sole discretion to suspend or terminate the Contest or any portion thereof. Liability Limitations: Contestants agree to abide by the terms of these Official Rules and by the decisions of Sponsor, and agree to indemnify, release, defend and hold harmless the Sponsor, and any affiliates or agencies, as well as the officers, directors, and employees of each from and against any and all liability for loss, damage, harm, injury, cost, or expense whatsoever including without limitation personal injury, publicity rights, defamation, invasion of privacy, emotional distress and / or death arising from or in connection with participation in Contest or the acceptance or use / misuse of a prize, including but not limited to travel.